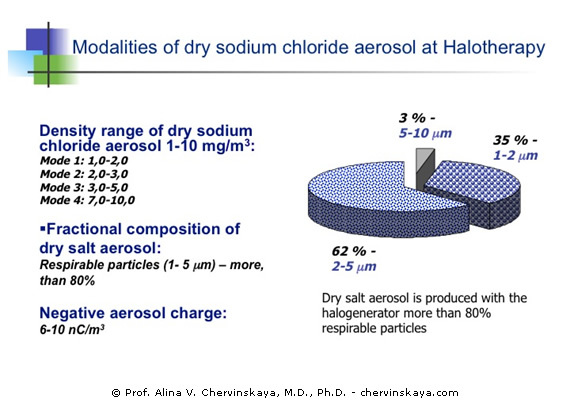 Dry sodium chloride aerosol | Prof. Alina V. Chervinskaya, M.D., Ph.D. Highly dispersed dry sodium chloride aerosol (halo-aerosol) of the specific concentration range (from 1 to 10 mg/m³) with controlled parameters is the primary acting factor of the Controlled Halotherapy. The majority of the particles, at least 80%, in the generated aerosol environment are that of the respirable size (i.e., particles of 1 – 5 microns), which acts most efficiently in all segments of the respiratory tract. 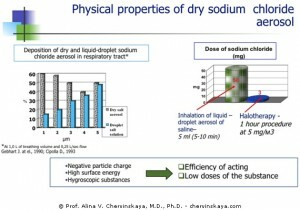 Due to the dispergational method of a dry aerosol formation through a powerful mechanical impact on the salt crystals, such particles receive high surface energy and negative electrical charge. Specific physical-chemical properties of the dry aerosol determine the nature of Halotherapy method, that is distinguished by a multi-component therapeutic effect of tiny doses of the substance. Aerosols, which contain a lot of particles larger than 5 – 6 microns in size, are not efficient for the respiratory tract. At the same time, they can cause irritation and hyper-reactivity, especially in patients prone to bronchospasm. 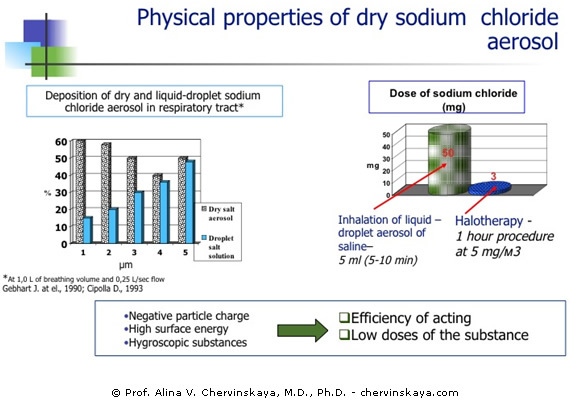 Large particles of dry salt aerosol (over 5 – 6 microns) irritate the upper respiratory tract (particularly with the propensity for mucosa atrophy) and integuments.